The inspiration for ShowHouse Santa Fe 2016 derived from the theme of "Everything Old is New Again, Mexico!!" For Jennifer Ashton the design comes from her family roots of Guanajuato, Mexico where the Taking inspiriaiton from a 150 year old mexican cultural phenomenon this is the most unusual attraction - El Museo de las Momias (The Museum of the Mummies) is considered one of Mexico’s best tourist attractions, described as both fascinating and strange, the museum displays 100 corpses preserved and contained for all to see .The aged tones of the walls and the height of a wall wainscoting and pattern play of geometric forms are taken from this concept in form. 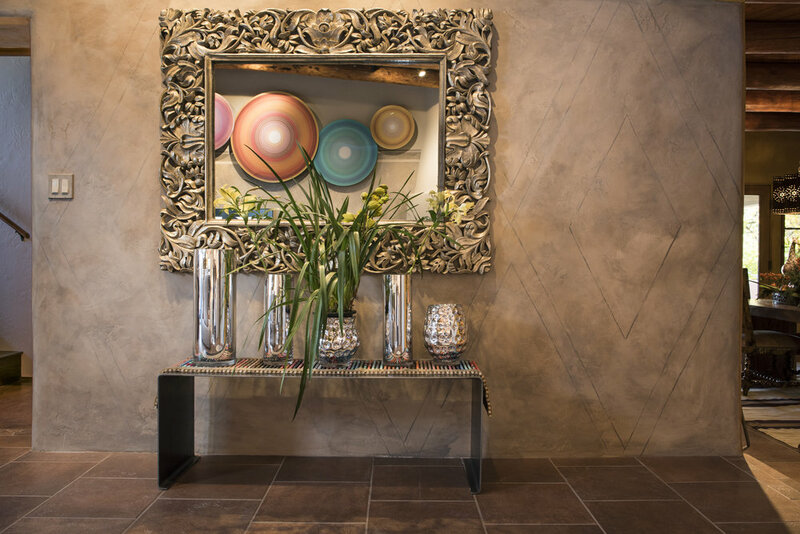 The Old Mexico inspiration made modern day in Santa Fe, New Mexico is a personal expression of family, modernity and the fun factor. In collaboration with talented artist, Cindy Peck she interpreted the walls with a process of layers of paint tones, and wax. The art story comes alive with the major installation by Chirstopher Martin Gallery featuring his Disc series and a personal touch of Hunt Slonem - Bunnies provided by Pippin Contemporary..